For the second straight season, the Houston Astros have on the AL West. The division was locked up early Wednesday morning when the Oakland Athletics lost to the Seattle Mariners. Unfortunately, that game was played a few hours after the Astros won their 100th game of the season in Toronto to push their magic number to one. However, the club gathered in their Toronto hotel to watch Oakland’s loss and celebrate. They will have their real celebration with countless bottles of champagne following Wednesday’s game. This year’s division title did not come nearly as easily as last year’s AL West title did. The Astros were pushed all season, rarely holding a comfortable lead. The Mariners stayed close with them during the first half of the season. When Seattle dropped off, the A’s made a surprising charge to keep the pressure on Houston. Last year, the Astros won the AL West with a 21-game cushion. But they’ll be lucky to hold off Oakland by five games this year. The Astros have also been hit by the injury bug more so than last season. Core players like Carlos Correa, Josh Reddick, George Springer, and Jose Altuve have all spent time on the DL. However, Houston’s starting rotation has managed to stay healthy for most of the season. The Astros have barely used any rotation depth outside of the five pitchers who began the season in the rotation. The Astros are indeed peaking at the right time. They are 18-4 since the calendar flipped to September, the best record in baseball. The Astros are also the best road team in baseball, going 54-22 away from home. 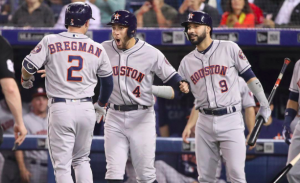 Those two records are two big reasons to believe that the Astros are serious contenders to repeat as World Series champions. With less than a week left in the regular season, the Astros are clearly the hottest team in baseball. The only thing the Astros haven’t won this season is home-field advantage in the American League playoffs. That honor will go to the Boston Red Sox. However, they will get the home-field edge in the ALDS against the Cleveland Indians. The Astros won four of seven head-to-head meetings with the Indians this season. While Cleveland shouldn’t be overlooked, the Astros will surely be favorites to win that series. More importantly, the Astros should be considered one of the top favorites to win the 2018 World Series.